Jerky guns offer fans of regular jerky the chance to make it with ground meat instead of long-fiber meat cuts, resulting in a product that is less tough and fibrous. Ground meat jerky can accept flavor more readily and can include products such as turkey or lamb. 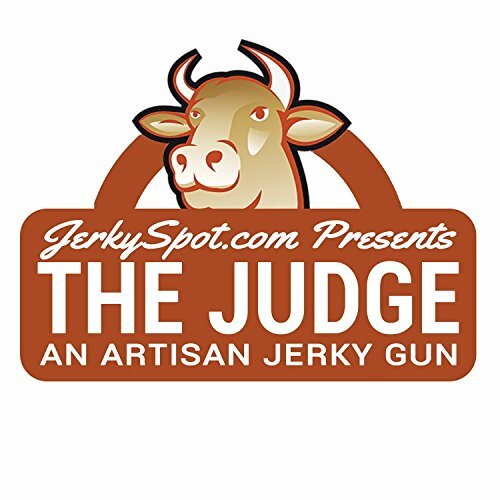 Our top pick is "﻿﻿T﻿﻿he Judge" jerky gun by JerkySpot. In this guide we will look at various units to help you determine the best jerky gun for you and your kitchen through our model comparisons and jerky gun reviews. * A few jerky guns don't have an exact capacities listed in their specifications either with online retailers or the brand's website. In our research we've found that the Nesco BJX-8 and the Sportsman MJG15 can hold about 1 pound of ground meat. The Nesco BJX-8 is a plastic jerky gun with three plastic nozzles. It has got a stainless trigger and ratchet mechanism for a bit more durability. The entire unit comes apart for cleaning when you're done. The Nesco is a bit smaller than our other picks, but you can load it with a bit more than a pound and a half of meat at once. Despite the plastic cylinder, this gun is thick and sturdy enough to resist cracking under pressure. If you're serious, you'll want to make the step up to an all-metal gun eventually, but this is a great option to start with if you're unsure. The Nesco comes with several flavoring and cure packets. It's quite convenient to have them included in the box so you can get started making jerky right away. Commercial spice and cure packets can be quite pricey, so you may want to factor the cost of 4 lbs. of seasoning into the purchase of this gun. When you fill the entire cylinder and push vigorously on the trigger the end may pop right off. Nothing breaks, luckily, but you will have to stop and reassemble things before you continue. To keep this from happening, make sure your meat is finely ground and keep the cylinder less than 3/4 full. If you're looking for a basic jerky gun or you think you'll get a lot of value out of the included cure and spice packets, the Nesco Jumbo Jerky gun is a great option to consider. If you're a bit more serious about jerky, consider one of the models with a metal tube. When you're ready to move up to a more serious jerky-squeezing apparatus, "The Judge" is one of the better choices. 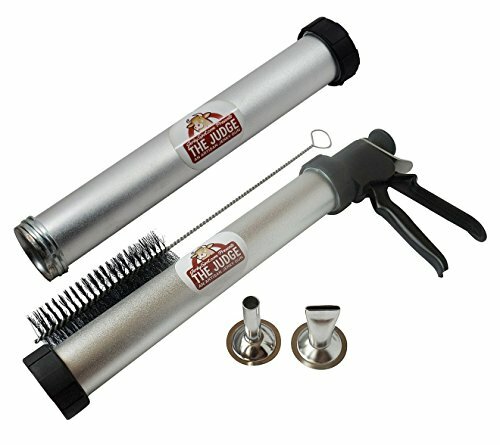 JerkySpot's gun uses an aluminum barrel and steel nozzles to withstand the pressures involved in squeezing meat out of a narrow opening. Unlike the other models, they've included an extra barrel in each package and each cylinder holds just under 1.5 lb. of meat when fully loaded. You can load both with meat and shoot them in rapid sequence or enlist a family member to load the spare as you squeeze out each full barrel. Unlike some plastic units, this jerky gun will stay together while you squeeze. If all of the nuts and bolts are tightened, you're free to push as hard as you want and go fast. The gun shouldn't break or fall apart. There's also a brush included to help make cleaning easier, but cleaning this gun is more of a hassle than it needs to be. The cylinder pops out easily enough, but meat has a habit of getting stuck in between the piston and the washers on the front. You'll want to disassemble the plunger end frequently and clean everything out. There's a sealed gasket on the back that prevents and food particulate from getting into the trigger assembly, so you should be fine on that front. If this fails for some reason, you can get access to everything with a screwdriver and a bit of patience. If you make a decent amount of jerky, the JerkySpot metal jerky gun offers sturdiness, speed, and durability over a plastic model. 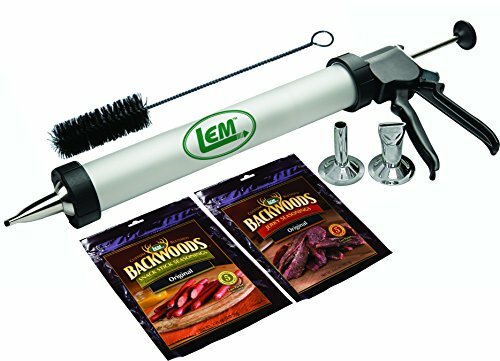 The LEM Products jerky gun has an aluminum barrel, two stainless steel nozzles, and comes with two bags of jerky seasoning. It's very comparable to the JerkySpot gun. Other than branding, both units appear to be almost completely identical. The trigger action varies slightly, but you'd be hard-pressed to tell the difference between these guns based on either their appearance or the jerky they output. 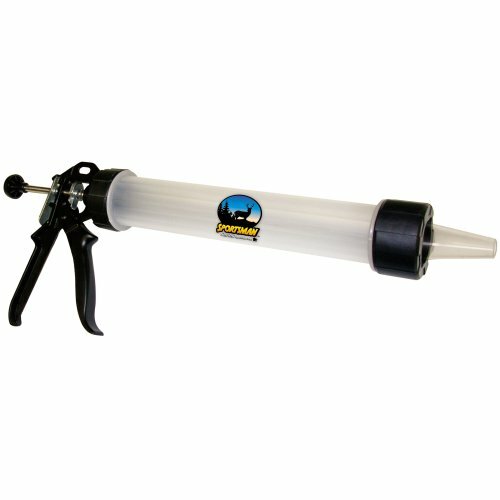 The Jerky Cannon offers the same durability and build quality as the JerkySpot gun. You can squeeze very fast, and the aluminum cylinder is very easy to clean. Again, there's going to be some meat stuff that slides in between the plunger washers. You'll need to pop those apart to fully clean out your unit. As far as differences go, the JerkySpot has an extra cylinder in the box, while this has two packets of seasoning. The extra cylinder is arguably more useful if you plan to use your jerky gun a lot, but it's certainly not necessary. The current model on their website has a double snack stick and double jerky strip attachment by default, as well as 12 oz. of jerky seasoning. A full load of meat comes out to about 1.5 lb. The Weston Original is plastic barreled jerky gun that comes with some stainless steel attachments. Frustratingly, Weston keeps changing the exact specifications of the gun and the attachments that are included. While this gun is plastic, it seems to hold together a little better than the Nesco allowing you to squeeze jerky out at a pretty fast pace. The gun disassembles fairly easy when it's time to clean it out. Cleaning is quite similar to any other unit. Other than the plastic barrel, there are only a couple things holding this gun back from being our top pick. First, there's some odd engineering with the plunger release button. It can take a lot of force to release the plunger to its resting position when it's time for the next load. Second, if you push the plunger all the way to the end, the plunger release button gets even harder to press. You can avoid this problem by stopping each load of meat about an inch from the end and loading the next batch. It is a bit frustrating that you can't squeeze out the full length of the cylinder easily. The Sportsman MJG15 has a plastic cylinder and two plastic nozzles. It doesn't come with spice packets or other accessories. It's about half as large as the Nesco, holding 1.5 lb. of meat in a full cylinder. This gun is sturdy enough for casual use. Unlike the Nesco, the end won't pop off while you're squeezing jerky out. This means you're free to go as fast as you want. If you plan to make a lot of jerky you'll probably still want to upgrade to an aluminum model at some point, but this is a nice way to get your feet wet without spending as much money. Why Buy a Jerky Gun? Traditionally made fibrous jerky is a high protein, low fat food. However, traditional jerky can be extremely tough and hard to chew. Many processed jerky brands are extremely high in sodium and artificial flavorings. By using ground meat, you can reduce the toughness and dedicated chewing time it takes to gain nutrition from jerky. By making your own ground meat mixtures, you can control the amount of sodium and artificial flavors in this easy to pack snack food. Depending on your jerky intake, you can reduce your grocery bills and your sodium and fat intake by investing in a jerky gun for the long term. You can also make your own custom blends of meats and include bits of flavor such as ground pepperoni to change up your ground jerky recipes. 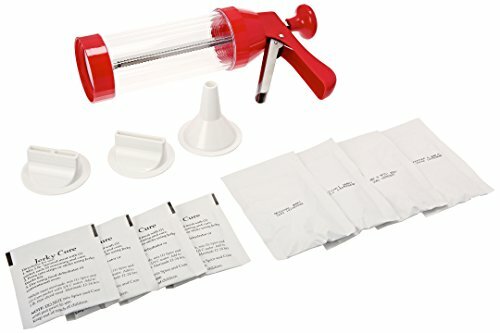 What Is A Jerky Gun? 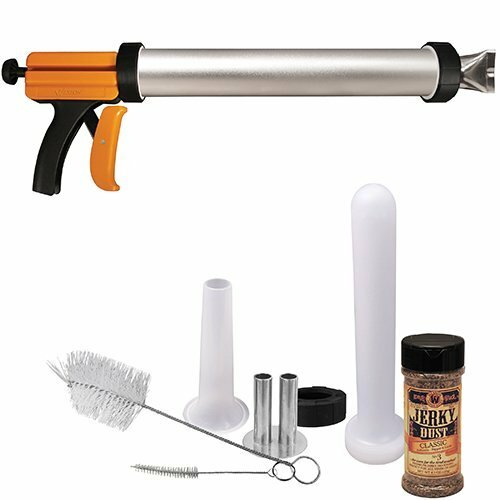 Jerky guns are manually pressurized tools that can be packed with seasoned ground meat. Once fully packed, the handle is squeezed until the meat is squeezed out, either in a long tube or a flat strip, depending on the tip used, so the meat can be baked and dried for long-term storage. If you've ever used a caulking gun or a grease gun, the mechanism is similar. Jerky guns need to tolerate pressure from the handle end. Durability is key because if the containment tube or the internal cylinder and handle mechanism split or pull apart under pressure, you won't be able to create a flat strip of ground meat. The containment tubes and pressurizing shafts for these tools are generally built of anodized aluminum or clear plastic with stainless steel tips and heavy duty plastic handles. There are jerky guns, cannons, and pistols. There is little difference between these products except for the name. Each has a handle, a pressurizing cylinder and a tip to shape the ground meat. The tips with your jerky gun determine the style of jerky you'll ultimately create. If you like narrow tubes of meat similar in size to pepperoni or cheese sticks often sold as snacks, you'll need to use the circular tip. For a flat strip of jerky, use the fan tip. Tips are available in plastic or stainless steel. Your kit will likely include a cleaning brush. While both plastic and stainless steel tips can probably go in the dishwasher, take care to completely flush the tips and clean them with soapy water before sending them through the dishwasher. The meat cylinder will either be made of plastic or aluminum. Take care when packing this cylinder with the ground meat mixture so the tube is not full of air pockets, or your jerky will be of an inconsistent thickness and may burn in spots or not dry completely in other spots. Many jerky gun tips include a feeding flange and a tamper to make it easier to get the ground meat mixture into the tube. This portion of your jerky gun will generally include a handle and a piston mechanism. When mixing your ground meat, check it for large chunks that may get caught in the tip, particularly if you grind your own meat or are working with game meat such as venison. Jerky needs to be thoroughly dried so any remaining bacteria or mold spores can't grow in the meat once it's stored. Once it's done, store it in a cool, dry spot. You can also freeze or refrigerate it. If you're handling ground meat on any countertop or cutting surface, these surfaces need to be cleaned with a bleach solution. By mixing 1 teaspoon of bleach with 1 quart of warm water in a spray bottle, you can keep a simple bleach solution at hand for a quick clean-up any time you work with raw meats. Ground meat jerky is a terrific source of protein in a quick, portable package. Properly handled, heated and prepared, this food source can be split into separate packages for a quick grab-and-go snack. If your first taste of jerky as a kid put you off the stuff, be aware that ground jerky has a very different texture and mouth feel. It will break up more easily and be easier to chew. In addition, making your own ground meat jerky with a jerky gun gives you the chance to work with your favorite flavorings and mix a custom blend for handy, healthy snack. Making jerky as a family is a terrific way to teach older kids about food handling safety as well as pride in preparing their own food and snacks. Through this process, they can also learn the joy of preparing food for other people. Finally, remember that you don't need a food ﻿﻿de﻿﻿hydrator to make ground jerky. In fact, per food safety experts at Oregon State some commercial dryers cannot get hot enough to make safe jerky. Your ﻿﻿oven can give you a more consistent drying quality and temperature. Take the time to experiment with your favorite flavors and find a recipe you and your family will love. Did you enjoy this guide? Let us know in the comments with your favorite jerky gun, recipes and experiences. Barbecuing vs Grilling - What's the Difference?